Will the Fed Hike Interest Rates? How Will the Markets React? 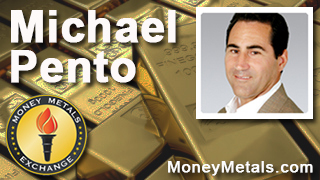 Coming up we'll hear a tremendous interview with Michael Pento of Pento Portfolio Strategies. Michael sees the air coming out of what he calls an epic bubble. And he reveals the asset classes he believes will do well – plus those to avoid. Don't miss an incredibly important and insightful interview with Michael Pento, coming up after this week's market update. Well, choppy trading continues in precious metals markets as volatility tamps down in equities. The VIX stock market volatility index has moved from a four-year high of over 50 two weeks ago to around 25 this week. For perspective, the 52-week moving average on the VIX is at 16, so a 25 reading is still well above average for the past year. An elevated VIX may dissuade the Federal Reserve from hiking rates. Any move by the Fed that is perceived to be adverse to the stock market could cause volatility to spike in a sharp sell-off. The Fed meets next Wednesday and Thursday for its long-awaited decision on interest rates. Policymakers appear to be split on whether to hike short-term rates for the first time in more than 9 years. Fed watchers are also divided as to whether the central bank will finally end its zero interest rate policy. Based on futures contracts traded on the Chicago Mercantile Exchange, the market is now saying there is a 74% chance that the Fed won't raise rates next week. However, the futures market is pricing in a 60% probability of a rate hike before year's end. Interest rate hawks point to job gains and a declining official unemployment rate. Last Friday's jobs report showed unemployment fell to 5.1% in August. But the unemployment rate the government reports fails to capture most of the people who are actually out of work. Fed economists are well aware of the fact that a record number of Americans are now out of the workforce – with the labor force participation rate at a 38-year low of just 62.6%. That translates into a jobless rate of 37.4%. Quite a stark contrast to the jury-rigged official unemployment figure of just 5.1%. Just a few weeks ago, most experts expected a quarter-point rate hike in September. Now the odds are against such a move. It's been a recurring pattern. The Fed persuades everyone to expect a rate hike and rosy economic growth numbers. And then when the data falls short, expectations for a rate hike decline. Economist Dean Maki: It's really unclear even a week before the meeting which way the committee's going to go. Bloomberg Interviewer: You don't know or you don't have a professional guess what they're going to do. There's that much uncertainty. Economist Dean Maki: I think if the meeting were held today the Fed probably wouldn't go but the problem with having a strong stance right now is that the Fed has made markets a big part of the decision. Jasper Lawler of CMC Markets: Gold may actually be sought after like it has been in the past few weeks because if stock markets start to fall off, gold is actually a safe haven and so the Fed hiking interest rates and causing a stock market crash may mean that actually gold prices can go up. Of course, the Fed also could be too late to combat higher inflation. They may be a bit behind the curve, which a lot of people are saying they are, and so then future higher inflation again would be a reason to hold gold. Investors should brace for market gyrations following next week's Fed announcement, whichever way it goes. As for this week's market action, gold prices fell to touch the $1,100 level on Wednesday and found some apparent support. Gold rallied modestly from there to finish at $1,111 an ounce Thursday but are slipping today and are nearing those lows for the week yet again. As of this Friday recording, gold comes in at $1,102 an ounce, off 1.6% for the week. Silver, meanwhile, closed Thursday at $14.69 an ounce for a slight weekly gain. It has reversed into negative territory with a decline today with the silver market currently trading at $14.40, registering a slight loss now of 1.0% on the week. One potential tailwind for the metals markets is strong seasonal jewelry demand out of Asia. September tends to be the biggest month for Indian gold buying. And historically September is a seasonally strong month for precious metals spot prices. Seasonal strength hasn't kicked in reliably though since the 2011 peak. The Fed's upcoming decision could further upset the seasonal tendencies or light a fire under them, depending on the market's reaction. Low silver spot prices have certainly lit a fire under the retail bullion market for silver. Demand has outstripped supply for most common bullion products, causing premiums to soar, especially on junk silver prices and Silver Eagles. Foreign mints have helped to keep the coin market supplied, at least for now. Here at Money Metals Exchange, we currently have availability in silver coins minted by Australia's Perth Mint and the British Royal Mint. Otherwise, inventories are scarce and supply pipelines are heavily backlogged for most silver bullion products. Mints just aren't able to keep up with retail demand. Although the gold market still appears well supplied, the potential for the silver market to get even tighter exists if these extreme market conditions persist. Well now, for more on what the Fed may do next week, the bleak economic outlook and what it all means for gold and silver, let's get right to this week's exclusive interview. Mike Gleason: It is my privilege now to be joined by Michael Pento, president and founder of Pento Portfolio Strategies and author of the book The Coming Bond Market Collapse: How to Survive the Demise of the US Debt Market. Michael is a money manager who ascribes to the Austrian School of Economics and has been a regular guest on CNBC, Bloomberg, Fox Business News, among others – as well as this podcast. Michael thanks for joining us again today. Welcome back. Michael Pento: Thanks for having me back, Mike. Mike Gleason: Well there's lots to talk about here and I know time is very limited so we'll get right to it. We've had a wild summer here in the financial markets with the Greek default, a stock market crash in China, and now tremendous volatility in our own equities markets. What's the root cause of all of this market turmoil as we head into the fall? Michael Pento: I can answer that and it'll probably take the whole podcast to discuss. But one of the reasons we're having this turmoil is because we've had about seven years of zero percent interest rates and massive amounts of quantitative easing, $3.7 trillion worth to be exact. Now the Fed is threatening to reverse that. That's just the tip of the iceberg. Stocks are almost as universally loved as they've ever been in history. I don't look at surveys that look at consumer sentiment or mutual fund managers sentiment. I look at the level of margin debt, which was, up until the middle of August, at a record high and the record low level of cash is about 3.2 percent of assets at mutual funds. So money managers have never been more bullish and yet stocks, and maybe because they've been so bullish, stocks are overvalued by almost every significant metric that I use. I look at sales, I look at total market cap as a percentage of GDP, I look at the Q ratio – which looks at the book value or replacement costs of stocks vs their valuation. These metrics are off the chart. Not only stocks are so expensive, but there's currently a lack of revenue and earnings growth for S&P500 companies. If you have falling revenue, falling earnings growth, massive overvaluation, the Fed is going to hike interest rates supposedly sometime in our lifetime, but according to them at least before the end of the year one time. And mutual fund managers are overwhelmingly bullish, then I think I better be cautious and so should your listeners. Mike Gleason: Speaking about the Fed and raising rates, September has been talked about for months now when it comes to when they may look to raise rates. Now when we had you on the podcast in the spring, you indicated that we're looking at an epic bubble in financial markets and it seems we're starting to see some of the air come out of it now. What do you think the Fed is going to do here, Michael? Can they raise rates in this environment? If they do, are we likely to see subsequent rate increases in the months following? Michael Pento: What I think they should do is, and let me get that off the table first so you understand where my mindset is at. I know the Fed has a $4.5 trillion balance sheet. If I had my druthers, Mike, they would announce that they would sell a trillion dollars worth of assets over the next four years say – and just be out of the business of manipulating the cost of money. That's if I had my druthers, but I don't. Nobody asks me what I believe, except you. Certainly nobody at the Fed. So let me tell you what I think they're going to do. The Fed is looking very closely at something that they are very much enamored with called the Phillips Curve. The Phillips Curve says that once the rate of unemployment drops below some imaginary number... and it used to be seven percent then it was six, now it's 5.1 percent, which is where we are right now… that wage pressures build, they explode and the rate of inflation becomes intractable. If you look at the unemployment rate being at 5.1 percent and if you look at the JOLTS numbers which came out earlier this week, I believe that the Federal Reserve will raise rates on September 17th at 2pm. I'm not convinced of that. Don't forget, I'm reading the mind of schizophrenics. I'm trying to read the mind of people who have no idea what they're doing themselves. I'm going out on a limb and saying since I know that they are Phillips Curve devotees, that they most likely will raise a quarter percentage point. But here's the problem. The narrative on Wall Street is one that loves to promulgate myths. The current myth is that the Federal Reserve will raise interest rates just once and then disappear until the 12th of never. Now the Federal Reserve has never raised interest rates once. They've always raised at least 300 basis points, and the last time they raised rates from 2004 to 2006, they raised rates 425 basis points. The Fed has something called the “dot plots” that tells you where they want to be at a certain point in time. The median dot plot says currently that the FOMC, the Federal Open Market Committee, wants to have the Fed funds rate at 1.6 percent by the end of 2016. I know this, the market knows this. So if the Fed gets off of zero, the market is going to price in about 100 basis points of movement in 2016 or more. I think that absolutely wipes out the derivative market, it wipes out the real estate market, it wipes out the stock market. I'm very much concerned about what's going to happen here going forward the next week or so. Mike Gleason: We're certainly taking lots of calls from our customers who are growing increasingly worried about a new financial crisis this fall. Is your clientele spooked about anything in particular and do you see any events that you're particularly concerned about? What are you urging your clients to do right now? Michael Pento: My clients aren't spooked. My clients are with me because they believe in my narrative. My narrative is very clear. I want to own those things that have already priced in a series of rate hikes. What is that? Clearly that is commodities. Commodities have been pricing in since 2012, really, the collapse of China, the collapse of the emerging market, a reversal of the carry trade, and several real interest rate moves higher. So I want to own gold and I want to own oil right here. Those are the only two things that I'm comfortable being long. And to offset that, I want to have a tremendous short position in the stocks. Right now my clients are positioned for chaos in the markets, a big leg down. And by the way let me be specific. I look at revenue. I look at the market price vs sales. I'm looking at a 1.4 market price to sales ratio. That puts the S&P500 at about 1,600, 1,632, right around there. We're above 1,900 as we speak as this recording. I'm looking for a significant downturn in the stock market. That's what my clients are positioned for and because I believe that chaos is going to be very intense in nature, I'm sequestered in gold mining shares, which have been mercifully beaten up for the past three years. Mike Gleason: We're also in the midst of, what I've heard you call before, a currency debasement derby, where the Chinese have certainly kicked things up a notched there recently. Since metal prices are so often tied to the currencies and most specifically the dollar, are we finally going to see gold and silver prices rise again here given all these shenanigans with monetary policy? Michael Pento: I believe that the major increase in the US dollar, which occurred really over the past year or so, was in anticipation of lift off from zero percent interest rates. If you look at the DXY, we've gone pretty much from September of last year (when) it was around 84, we peaked around 100 in early March, and now we're rolling over slowly to 95, 95 1/2 on the dollar index, which is mostly measuring the US dollar against Europe and, to a lesser extent, Japan – the Japanese Yen. What I believe, firmly, is if the US Federal Reserve starts to raise interest rates, that you're going to have a short term boost in the value of the US dollar, probably edging closer to that 100 on the DXY. Since I also firmly believe that we are already in a worldwide deflationary collapse, and I can point to a myriad of data point. I can look at trade, I can look at port volumes, I can look at base metal prices. I can look at commodity prices as a whole. I can point to the recession in Brazil and Canada and Russia, Australia. The whole world is either in recession or teetering on a recession. That includes the United States by the way which the Atlanta Fed has Q3 at just 1.5 percent (GDP growth). I believe that the Federal Reserve will only be able to move several times before it becomes obvious, even to the FOMC, that the world has entered into a deflationary collapse. Sometime between then and now, the US dollar rolls over and rolls over hard. I think it goes back to 84, the low eighties, and that's going to be a huge boost, a huge tailwind for precious metals, and especially mining shares. Again, they're down 85 to 90 percent in the last three years. Let me just add this, Mike. Even though the fundamentals for owning gold have never been more compelling, if you look at the size of central banks' balance sheets, that increase in base money, it has risen at an unprecedented rate and to an unprecedented level. And if you look at the solvency or insolvency condition of nation states, it has never been more precarious. That's why you want to own gold. The bullish case for gold has never been better, and yet mining shares are priced like it's going out of business. Mike Gleason: Expanding on that a bit and as we wrap up here, talking about the mining shares and also just about the spot prices, we seem to have this disconnect from the physical market and the fundamentals. There are lots of reasons for people to seek safe haven in metals these days and they certainly are when it comes to the physical metal, we can attest to that. But none of the surge in buying demand that we've been seeing has been reflected in spot market prices yet. Traders in the futures market just keep selling away. What are your thoughts on this disconnect? Michael Pento: My thoughts are the Algos and the Robo-Traders at Goldman Sachs and Morgan Stanley just look at the value of the US dollar and where they think it's headed. And they believe in this phony fake narrative that the Federal Reserve can seamlessly end seven years of ZIRP (0% interest rates) and seven years of QE in isolation, unilaterally take interest rates up to, as the dot plots indicate, close to 1.6 percent on the Fed funds rate by 2016, without causing any damage at all. This is clearly a fantasy. This is clearly false. If you look at the reaction the markets have had leading up to this first rate hike, every time the market believes the Fed is going to start on this cycle of rate hikes, the stock market collapses. It dropped 1,000 points last week, just on the notion that they're about ready to raise interest rates. Today you had Larry Summers, former Treasury Secretary, come on CNBC and beg the Federal Reserve not to raise rates. You imagine that? Begging the Fed not to raise rates because the stock market is down six percent from its high? It's ridiculous. You had the IMF and the World Bank joining in the chorus. So the market is artificial. The economy is ersatz in nature. Not only US market and economy, but the global economy. It's all built on currency depreciation, central bank money printing, which, by they way, it just seems to circle around the canyons of Wall Street. It does not engender economic growth. You look what is going on in Japan. If I can touch on that briefly before the interview's over. Japan started the year, the Nikkei Dow, started the year at 17,400, went to 21,000 as of August the 10th, collapsed all the way down to 17,400 as of Monday. This is a nation that is printing massive amounts of Yen. They have a quadrillion Yen in debt, 250 percent debt to GDP, Shinzō Abe (Prime Minister of Japan) came in with (Governor of the Bank of Japan Haruhiko) Kuroda, the central banker, printing massive amounts of Yen since December of 2012. Japan is in yet another recession. The third one since 2012. What I'm trying to tell you is that quantitative easing and central bank manipulations are wonderful for stock prices until they aren't, but they have never done a damn thing about providing the middle class with sustainable, viable economic growth. We are learning that. Even though this faith in central bankers has never been higher, I think that faith is eroding and is going to erode very quickly. That's another reason why I own gold right here and right now. Mike Gleason: Excellent stuff, Michael. We always appreciate your insights. Thanks for being so generous with your time. I know you've got to go here. Before we let you go, tell people how they can follow you more and then also about your firm if they want to check that out. Michael Pento: I provide market research by my podcast and I also manage money for high net worth individuals. My website is PentoPort.com. My email address is [email protected] The office number here is 732-772-9500. Love to talk to some of your listeners. Mike Gleason: Very good. Thank you again, Michael and we'll look forward to catching up with you down the road. Have a great weekend. Michael Pento: Thanks for having me on again, Mike. Mike Gleason: That will wrap it up for this week. Thanks again to Michael Pento of Pento Portfolio Strategies. For more info visit PentoPort.com.